The Book of Isaiah (Hebrew: ספר ישעיה‎, Sefer Yeshayahu) presents the career of the prophet Isaiah. It is the first of the Latter Prophets in the Hebrew Bible and the first of the Major Prophets in English Bibles. 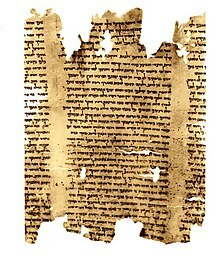 The oldest surviving manuscripts of Isaiah are two scrolls found among the Dead Sea Scrolls; dating from about 150 to 100 BCE, they are substantially identical with the Masoretic version which forms the basis of most modern English-language versions of the book. is based on merely human rules." I am God, and there is no other. I am God, and there is no one like me. From the beginning I foretell the outcome, and from long ago the things that have not yet been done. I say, ‘My decision will stand, and I will do whatever I please. I have spoken, and I will bring it about. I have purposed it, and I will also carry it out. Righteousness will be the belt around his waist, And faithfulness the belt of his hips. That I am God, and there is no other. I am God, and there is no one like me. And from long ago the things that have not yet been done. So my word that goes out of my mouth will be. And it will have sure success in what I send it to do. Who are these that fly along like clouds, like doves to their dovecotes? For in me the islands will hope; the ships of Tar′shish are in the lead, to bring your sons from far away, along with their silver and their gold, to the name of Jehovah your God and to the Holy One of Israel, For he will glorify you. The little one will become a thousand. And the small one a mighty nation. I myself, Jehovah, will speed it up in its own time. For here I am creating new heavens and a new earth; and the former things will not be called to mind, neither will they come up into the heart.